Touchstone Foundation for the Arts (TFA) 2016–2018 Emerging Artist Fellowship recipient Carol Moore offers a distinctive collection of original Lithographs and Intaglio prints that are her personal response to the natural world. Her fellowship will culminate with a solo exhibition at the Touchstone Gallery in Washington, DC, during the month of May 2018. As an artist, Moore began her studies in printmaking in 2010 at Montgomery College in Rockville, Maryland. She has exhibited her work both locally and nationally. She has participated in local juried exhibitions such as the Strathmore Center for the Arts in Rockville, Maryland juried exhibits “What’s on Your Mind”, “Artist’s in The Kitchen” and more recently, “Poe and Puck”. Nationally, she has been juried The Maryland Federation for the Arts in Annapolis, Maryland annual exhibit “Art on Paper” and the 2016 and 2017 Delta National Small Prints Annual Exhibition held at the Bradbury Art Museum in Jonesboro, Arkansas, winning purchase awards that placed her work in the museum’s permanent collection. 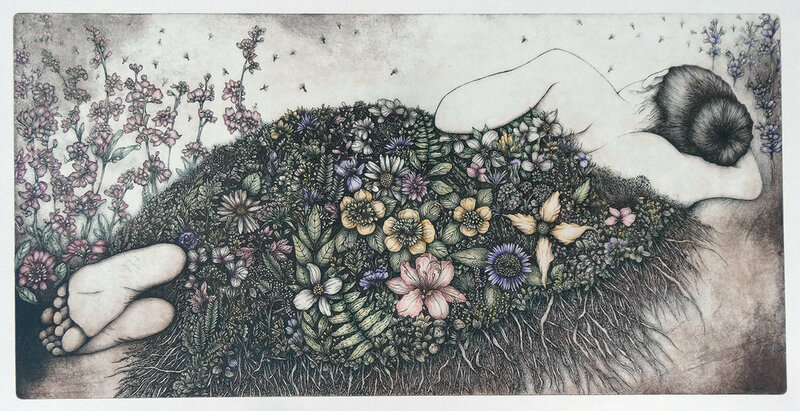 Working in both Lithography and Intaglio, Carol Moore responds to her personal experiences with nature often found in the natural plant specimens that she collects and manipulates. She searches for an emotional quality that links her to the natural world. Moore reveals her curiosity about nature with a collection of prints that expand from her human experience with the natural world, furthered by a detailed study of her subjects. Technically, her original prints are detailed and often hand-colored utilizing a technique that she developed that pushes color behind the ink creating a subtle, cohesive result. In her most current works, she experiments with the layering of thin, sculpted and etched aluminum plates. Carol’s Moore’s original prints will be on exhibit at the Touchstone Gallery May 2 - 27, 2018 with an opening reception on Friday, May 4, 2018.